We look at the biggest mistakes trailer towers make when using their trailers. 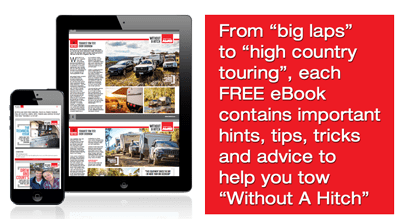 For many trailer owners, towing is something they do every now and then – taking a load to the tip, picking up some firewood, or helping the kids to move out (again). For the most part, trailers sit in the shed or around the back of the house for months on end. This means it can be tough to remember just what to do once you hitch up that trailer. In previous articles we’ve looked at how to tow a trailer; now let’s look at the mistakes to avoid. Regardless of whether you’re towing a fridge across town or grass clippings up the road, ‘loose loads make dangerous roads!’ It’s vital that your load is secured properly. Heavy items must be tied down, and particular attention paid to making sure the load is balanced. Light, particulate matter must be completely covered with a tarp. The weight ratings on your trailer and towing vehicle aren’t there as a suggestion – they’re there for your safety, the safety of those around you and to protect your property. Always observe the correct towing weights for your trailer and towing vehicle. If you’re only going up the road, do two trips. If you’re on the long haul, you need to up-spec your trailer. Observing your weight rating isn’t enough, however. Just because your trailer is rated to 2,000kg, it doesn’t mean you should stack 500kg of tiles at the back because it’s easier to handle. Instead, the bulk of your load (60 per cent) should sit ahead of your trailer’s axle(s). An unbalanced load can place undue stress on the trailer and undermine the handling of the towing vehicle. To keep you, your passengers and any other drivers safe, all trailers with weight ratings over 750kg must be braked. However, brakes are generally one of the most neglected components on a trailer. It’s particularly important to check drum brakes, as their components are completely hidden from view. Disc brakes require much less maintenance and, as the rotors are visible, it is much easier to diagnose problems. It’s very tempting to just hitch up, load up and drive off, but the reality is that those tyres have been stationary for months and probably need a check-up. The biggest issue is under-inflation, which leads to wear in the tyre walls, overheating and, ultimately, blowouts. If you haven’t towed a trailer in a while, it can be tricky to remember what exactly you should (and shouldn’t) do. But if you observe the rules, maintain your trailer and use your common sense, you should be well on the way to a successful towing trip. Here’s a bit more on what you need to check when pulling your trailer out of storage.